Getting Crafty with Jamie: One of the perks..
One of the many perks of being a Stampin' Up! demonstrator is that we get to receive AND pre-order from the new catalogs FIRST! I have to say this is one of my favorite perks because I LOVE Stampin' Up! product. I love the colors, I love the quality of the card-stock and I LOVE flipping through a new catalog and seeing all the amazing ideas! I wanted to show you a quick and easy card I made this weekend. It's using a new stamp set and designer series paper from the Occasions and Sale~A~Bration catalog which is set to go live on January 4th. 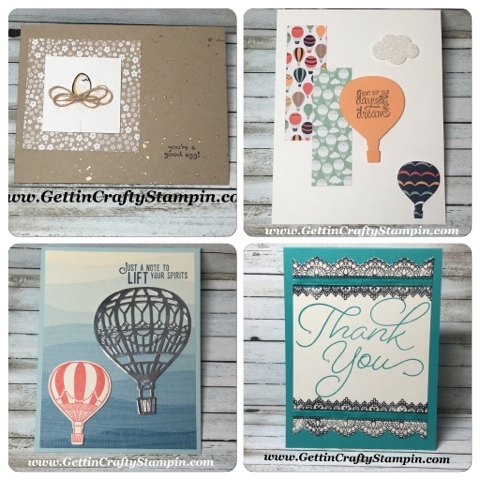 Being able to attend Stampin' Up! events is another amazing perks of being a Stampin' Up! demonstrator! 2. You can fill your starter kit with whatever product you want!!! 3. You can choose $125 worth of product but pay only $99 and no shipping!! 4. There are NO STRINGS ATTACHED! You are not obligated to teach classes or sell product. You can if you want and I'm happy to help but you don't have to. You can just enjoy the discount and the amazing community of creativity. 5. From January 4th to March 31st, you will be able to choose 2 additional stamp sets of your choice FREE!!! This is on top of the already amazing deal of the starter kit. 6. Once you purchase the starter kit from me, you get to enjoy all the perks of Team S.T.I.C. These exclusive perks include monthly tutorials, monthly Creative Connection stamping dinners, creative challenges with prizes and more! What are you waiting for?? Get ready to enjoy the fun of the Stampin' Up! family today!